A 25-year-old young male patient presented in casualty department with severe respiratory distress on the fourth day from onset of symptoms. The patient was nonsmoker and had no antecedent medical or drug history. Prior to admission, patient had dry cough and bilateral pleuritic chest pain for the last three days. He was in severe respiratory distress with use of accessory muscles of respiration. On examination, he had heart rate of 120 beats/min, blood pressure (BP) of 150/80, respiratory rate of 48-52/min and central cyanosis present. On systemic examination, reduced intensity of breath sounds with extensive rhonchi and crepitation was found in both lung fields, with other examination being within normal limits. On pulse oximetry, oxygen saturation was 28% on room air, which increased up to 36% with the help of 4 L oxygen via nasal prongs. PaO 2 /FiO 2 ratio was 100. Chest X-ray analysis was suggestive of non-cardiac pulmonary edema in view of bilateral fluffy opacity without cardiomegaly. In view of 2/3 positive criteria, his provisional diagnosis was Acute Respiratory Distress Syndrome (ARDS). He required mechanical ventilatory support and was gradually weaned over a period of 10 days. The patient was treated with broad spectrum antibiotics and other supportive measures. On re-evaluation of history, we found that he was a goldsmith by occupation, smelting silver and gold for the past 8-10 years. On the day of onset of symptoms, while smelting silver he was exposed to golden yellow fumes for around 15 minutes, with the quantum of exposure more than any other day earlier. From previous experience and analysis of similar silver metals, he was able to tell us that the silver was adulterated with large amount of cadmium on that day than before. Serum level of cadmium was 2.9 μg/L 6 days after initial exposure. At the time of discharge, he had residual opacities in the chest radiograph and resting oxygen saturation was 94% on room air. A 25-year-old man, a silversmith by profession, was admitted with rapidly progressive dyspnea. He was a nonsmoker and was in good health prior to the present illness. He related that while smelting silver, he had inhaled golden yellow fumes three days prior to admission. He developed a dry cough and bilateral pleuritic chest pain; dyspnea followed and worsened rapidly, prompting admission. He was acutely breathless with tachycardia (120/min), respiratory rate of 48-50/min, was diaphoretic and cyanosed. Chest auscultation revealed extensive bilateral crepitations and rhonchi. His oxygen saturation on room air was 30% and increased only to 38% on 4 L of oxygen via nasal prongs. Arterial blood gases on room air showed severe hypoxia (PaO 2 -40 mmHg), hypocapnia (pCO 2-2 5 mmHg and metabolic acidosis, pH 7.24). The PaO 2 /FiO 2 ratio was 100, denoting acute respiratory distress syndrome. His hemoglobin, routine blood counts, renal and liver parameters were all within normal limits. 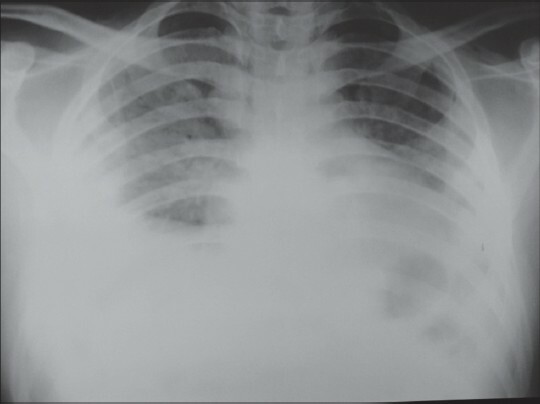 The chest [Figure 1] showed extensive bilateral opacities consistent with Acute Respiratory Distress Syndrome (ARDS). He was placed on a volume ventilator and on broad spectrum antibiotics as well as other supportive measures. He needed the assisted ventilation for 10 days, and thereafter, he was "weaned" from the respiratory support. At the time of discharge, he had residual opacities in the chest radiograph and resting oxygen saturation was 94% on room air. Serum level of cadmium was 2.9 μg/L 6 days after initial exposure. The upper limit of normal is 2.6 μg/L. A large number of goldsmiths and silversmiths in our country work in poorly ventilated workplaces. It is only to be expected that exposures over the safe limits of noxious fumes is commonplace. Comprehensive and critical study of these subjects with lung functions, etc., may indeed reveal subclinical illnesses. As suggested by Singh et al. , prevention of further exposure may be of great benefit. Substitution with cadmium-free alloys has been recommended. Finally, affected workers can claim compensation as legislation is being established with regards to human exposure limits. 1. Cadmium exposure and human health, ICdA fact file, ICdA North America, 9222 Jeffery Road, Great Falls, Virginia 22066, United States of America. 2. Cadmium, Health Canada- Environmental and Workplace Health. Available from: http://www.hc-sc.gc.ca/ewh-semt/pubs/water-eau/cadmium/index-eng.php [Last accessed date 2013 Jun 05]. 3. Singh N, Margekar SL, Jatav OP, Azimudin H. Nitrous fumes-induced acute lung injury in a goldsmith. J Assoc Physicians India 2013;61:290.